If you're looking to book a vacation, let's be honest. There's not too much of a difference between searching for flights and hotels on Priceline, TripAdvisor and Expedia. The companies seem to know that too. So does Wall Street. And investors are worried. Shares of Priceline (PCLN) plunged 13% and TripAdvisor (TRIP) was down more than 20% on Tuesday after reporting their latest earnings and disappointing outlooks after the closing bell Monday. Both companies have had to ramp up their marketing and advertising spending to attract customers. That seems to be coming at the expense of future profits. Priceline spent more than $4 billion on various types of advertising and marketing in the first nine months of the year -- up more than 20% from the first three quarters of 2006. It spent $1.5 billion alone in the third quarter. The company has been aggressively promoting its Booking.com unit in particular. And TripAdvisor spent $683 million on selling and marketing expenses in the past nine months, a 17% increase from a year ago. Both companies spent more than half their revenues on marketing and advertising in the first nine months of the year, a testament to how brutally competitive the business is. Just think about all the TV and online ads you see for Priceline and its subsidiaries as well as TripAdvisor and Expedia. Priceline lowered its profit outlook for the fourth quarter Monday, partly due to the increased competition. And TripAdvisor warned that it expects revenue growth to slow in the coming months. This news follows a disappointing earnings report from Expedia (EXPE) late last month. Expedia also is in the midst of a management transition after former CEO Dara Khosrowshahi left to take the top job at Uber. What's interesting to note is that while the travel search and booking business is having a rough time right now, the fundamentals for the overall leisure industry are actually strong. Hotel chains Marriott (MAR) and Hilton (HLT) have surged this year and are trading near record highs. Cruise line Carnival (CCL) has had a strong 2017 and its rival Royal Caribbean (RCL) posted strong earnings Tuesday as well. People are taking vacations. But all three online travel companies are dealing with tough competition from Google (GOOGL) as well. The search giant bought travel software firm ITA in 2011 and Google has been ramping up its travel presence ever since. In fact, travel research firm Skift recently estimated that Google's travel search business is worth $100 billion, which would make it the most valuable travel company. 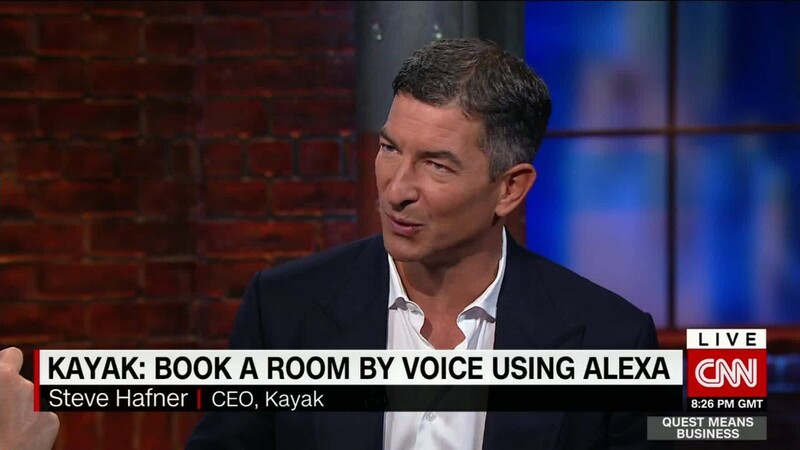 Priceline, which also owns Kayak, Cheapflights and OpenTable, is worth about $82 billion. Airbnb is increasingly viewed as a threat for the online travel giants too. Priceline CEO Glenn Fogel was asked on the earnings call about competition from "instantly bookable vacation rentals." And although the analyst and Fogel did not mention Airbnb by name, it seemed clear they were talking about the house and apartment sharing Silicon Valley unicorn, which is now worth nearly $30 billion. "I'm not naïve. I recognize we are not the leader in this space right now," Fogel said. "We are the leader overall for accommodations of all types of properties, but there is a competitor who is a little bit bigger and doing a little bit better, I suspect, than we are in this area." Still, Wall Street seems to think that Priceline has a better chance of going toe to toe with Airbnb and Google than TripAdvisor or Expedia. Analysts at Piper Jaffray and Jefferies kept their favorable ratings on Priceline Tuesday, citing the strength of all the company's different brands and the fact that management is often overly conservative with its guidance. But the two analysts have negative opinions about the outlook for TripAdvisor, especially since the company said Monday that it may spend even more on TV advertising next year.